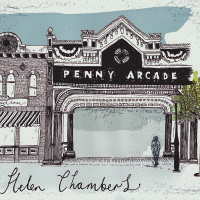 Helen Chambers’ debut full length, Penny Arcade out now! With the support of Chuck Ragan (duetting on the a capella, ‘Banners’), double bass player Joe Ginsberg and Dear Everyone band mates, El Morgan and Kelly Kemp. As well as fine production work and additional instrumentation from Morgan Brown (Down & Outs) and Paul Abbott (Good Grief) Helen Chambers has made an album to be truly proud of. CD comes packaged in a 6 panel digifile or available as a high quality download. You can purchase a copy of Penny Arcade here.